In the 1957 satirical film The Unfinished Comedy, made during Mao Zedong’s Hundred Flowers Campaign, one of the characters is a CCP censor who initially ensures a comedy duo of his support, only to become increasingly irritated as their show goes on. The irony was all too real. During his very brief stint as a satirist, Lu Ban 吕班 became one of Chinese cinema’s greatest — and shortest-lived — comedy directors. In the span of a year, between 1956 and 1957, Lu made three comedies satirizing life in Maoist China. The Hundred Flowers Campaign allowed Lu to poke fun at both ordinary people and even Communist Party officials, but when the Anti-Rightist Campaign quickly followed, Lu became an early victim in the crackdown. His third and most brilliant satire, The Unfinished Comedy (没有完成的喜剧 méiyǒu wánchéng de xǐjù), was condemned by the Communist Party, and led to Lu being labeled a “rightist.” The movie destroyed Lu’s career, getting him outright banned from filmmaking. A few years before, Lu might have been considered an unlikely candidate for a political provocateur. He was a Communist Party member, with roots stretching all the way back to the party’s Yan’an days. Before joining the CCP, Lu lived in Shanghai during the 1930s, acting in theater and film. 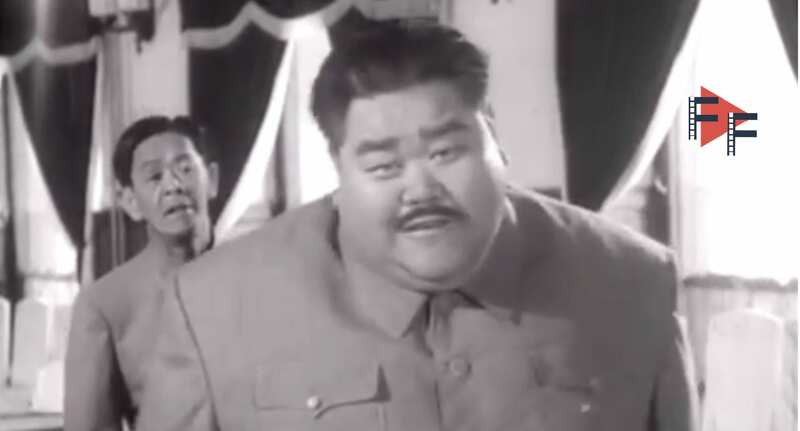 His comedic roles in movies like Crossroads (十字街头 shízìjiētóu) were quite popular with audiences, and Lu’s skits in a traveling theater troupe further built his reputation as a comedian during the Second Sino-Japanese War. By the spring of 1955, Lu contemplated dabbling in comedy again. With permission from a CCP official, he set up the Spring Comedy Society, a group to practice and write comedy scripts. Lu and his collaborating screenwriter focused on stories that satirized their fellow intellectuals, but the official who approved the group’s creation ended up criticizing their scripts. It was a frustrating experience, and while Lu gave up with the group, he wouldn’t have to wait long to make his comedy comeback. The next spring, Mao Zedong 毛澤東 launched the Hundred Flowers Campaign, relaxing censorship and inviting criticism of the CCP. For his first satire, Lu adapted a contemporary satirical play into a short film, Before the New Director Arrives (新局长到来之前 xīn júzhǎng dàolái zhīqián). The story satirizes corruption in the bureaucracy, depicting a low-ranking official who tries to kiss up to a new bureau chief before the man even arrives. The official is an unsavory liar who freely uses public funds to get new furniture, but his character is contrasted with the bureau chief, an honest director who eventually sets about fixing his underling’s misdeeds. Even with this positive portrayal of a higher-ranking bureaucrat, Lu was incredibly anxious while making the short, afraid that it might be considered too vulgar or inappropriate. It was passed by censors, however, and Lu was even lauded by some critics for tackling such a sensitive genre. Encouraged by the positive reception, Lu directed a second short titled The Man Who Doesn’t Bother about Trifles (不拘小节的人 bùjū xiǎojié de rén). Lu carefully toned down the political satire here, switching his target to intellectuals instead of bureaucrats. The main character, Li Shaobai, is a rude literary critic who goes to a conference to lecture about satirical literature. Li is absolutely full of himself, and constantly misunderstands other people. Like Before the New Director Arrives, The Man Who Doesn’t Bother about Trifles was greeted with plenty of positive responses. Still, while Lu tried to be more careful with this second short, this didn’t stop some critics from taking issue with its ridiculous main character and humor. After the release of his second short in January 1957, Lu went into production of what would be his best and boldest satire, a feature-length work that ridiculed censorship: The Unfinished Comedy. The movie stars Han Langren 韩兰根 and Yin Xiuzhen 殷秀岑, a slapstick duo from the 1930s and ’40s, playing themselves. After tearfully reuniting at a train station, Han and Yin head to Changchun Film Studio (where the movie was actually filmed) to put on a performance of three comedy skits. Their audience includes a movie director, journalists, and a CCP censor named Yi Bangzi. Initially, Yi assures Han and Yin of his support, but as the show goes on, becomes increasingly irritated with them. Each of the three skits is presented on a stage. In the first episode, Yin plays a bureaucrat who takes a vacation in order to lose some weight. His assistant (played by Han) mistakenly believes that his boss dies during the trip, and decides to give him an extravagant funeral. In the second episode, Han and Yin try to impress a singer at a dancehall, while in the third they play a pair of sons who abuse and cheat their mother. Yi criticizes and hates all three skits, and after arguing with an audience member, leaves the studio. On his way out, Yi leaves through the back of the stage and bumps into a pillar, causing a beam to fall and hit his head. Needless to say, the Communist Party wasn’t pleased. The timing was also poor: The Unfinished Comedy was completed not long after Mao called off the Hundred Flowers Campaign, initiating a backlash against the “reactionaries” and “rightists” who criticized the Chinese government. The Unfinished Comedy was denied a release, and Lu was attacked in the press. In one article, the official who earlier approved the Spring Comedy Society denounced Lu’s movie as “thoroughly anti-Party, antisocialist, and tasteless.” Ironically, some of Lu’s detractors quoted Yi Bangzi to justify their criticism against him. In struggle sessions, he was accused of being a rightist, with screenings of The Unfinished Comedy being used as proof for the charge. For his “crimes,” Lu was banned from filmmaking. By the time he died in October 1976, The Unfinished Comedy remained the last movie he ever worked on. Despite its obscurity, Chinese film scholar Paul Clark has called The Unfinished Comedy “perhaps the most accomplished film made in the 17 years between 1949 and the Cultural Revolution.” Political bravery aside, it’s an interesting and funny movie, and Han and Yin are a pretty loveable duo. As a whole, Lu and his satirical trilogy deserve to be better-known, and I’m keeping my fingers crossed these movies will someday be released on home video or streaming with English subtitles. Posted in Film, History	Bookmark the permalink.